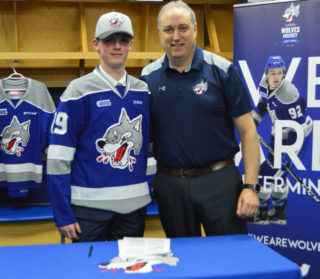 GREATER SUDBURY, ON – Friday night, the Sudbury Wolves will wear special Superhero themed jerseys for the 4th annual superhero game in support of local children’s charities. 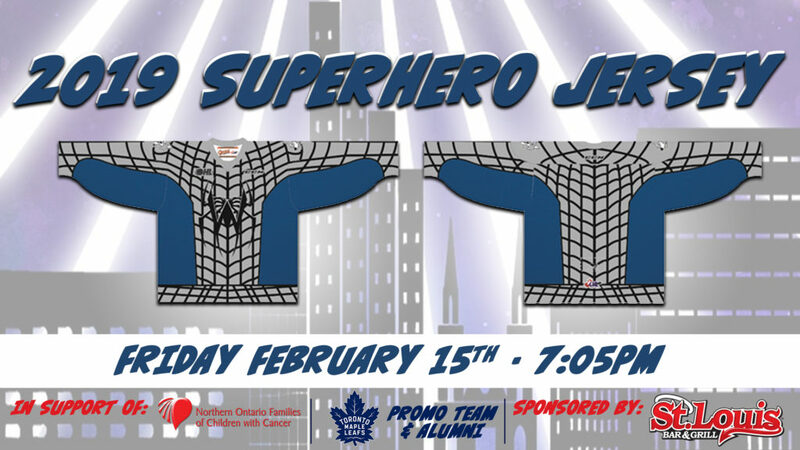 This year, the Wolves are excited to announce that they will wear Spiderman influenced jerseys as they get set to battle the Sault Ste. Marie Greyhounds in Game 5 of the Bell Challenge Cup at 7:05pm. These special jerseys will be auctioned off throughout the game with proceeds going to the NORTHERN ONTARIO FAMILIES OF CHILDREN WITH CANCER (NOFCC). A select number of jerseys will also be available online after the game for bid at www.auction.chl.ca. Friday’s game is sponsored by St. Louis Bar and Grill who have been the game’s annual game night sponsor since the inaugural game in 2016. St. Louis will be on hand with prizes for lucky fans. In addition to the jersey auction, funds for NOFCC will also be raised through the sale of Superhero themed t-shirts, with $5 from each shirt being donated to the charity. Fans can purchase a Superhero themed t-shirts at the Official Team Shops at the Sudbury Arena or online at sudburywolvestickets.com. Fans are encouraged to dress up as their favourite superhero for the chance to receive special offers and win prizes. Kids 12 and under wearing full superhero costumes will be able to receive admission to the game for only $12 and have access to a special concession offer. Don’t miss any of the exciting Wolves Hockey action! Tickets for both games are on-sale now at the Sudbury Arena Box Office, by calling 705-671-3000, or online at greatersudsbury.ca/tickets. Superheroes have extraordinary, even magical powers, powers to change outcomes and even make the impossible possible. Superheroes have no fear, and they believe there is always a way to win!